Clamping, bending and pressing operations are performed by Power Team hydraulic clamps. Available with 5 (CC5), 10 (CC10) and 25 (CC25) ton capacities, they are designed for welding and metal fabrication for fit-up of sheet or plate metal. Used with Power Team general purpose single-acting series of commensurate capacity. C Clamps are capable of withstanding the full rated capacity for compatible cylinders. Here at SGS Engineering Solutions you can find a brilliant selection of Power Team tools, including hydraulic C clamps. There are numerous uses for such a tool from clamping to bending and pressing, and this is the place to get a quality hydraulic C clamp. To alleviate the effects of off-centre loading, the CC5, CC10 and CC25 should be used with optional 350144 and 350145 swivel caps. At SGS we offer excellent prices and products of the highest quality, so look no further for your hydraulic tools. Why Choose Power Team Hydraulic C Clamps? Power Team is a well known and well respected name and hydraulic tools manufactured by this company offer excellent quality and reliability. Power Team hydraulic C clamps are made to high standards in the USA and they are very capable tools. 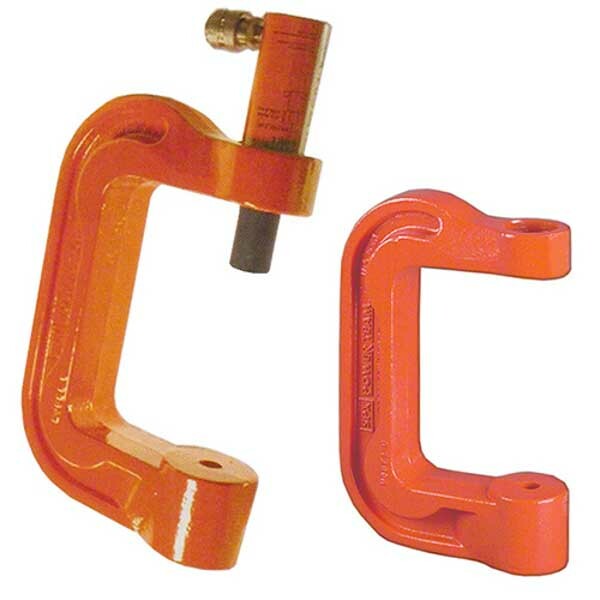 Hydraulic C clamps are used widely for clamping, pressing and bending, and often for welding and metal fabrication. Here at SGS you can choose from different clamps, offering a 5, 10 or 25 ton capacity. To discuss your requirements, any technical questions and for prices, call us on 01332 576 850. The Power Team hydraulic C clamps on offer here are great value so get in touch and invest in some excellent tools today.